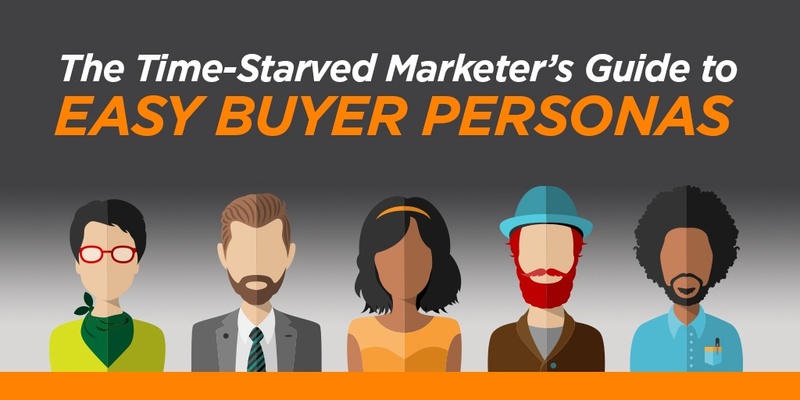 Buyer personas: two words that can strike fear into the hearts of many marketers. The trouble is, a good buyer persona takes significant time and effort to put together. That may be all well and good for a large company with a robust marketing team, but faced with the daunting task of customer interviews, extensive research, and translating all that data into usable personas, busy marketers are tempted to skip the step entirely. So is there a better approach that allows marketers to gain useful insights about their customers, without getting lost in the depths of endless customer research? We think so. A buyer persona is a generalized representation of your ideal customer, based on actual customer data, that helps you better tailor your marketing strategy. Buyer personas help you dive deeper to understand who your customers really are and what motivates them. This helps you focus your digital marketing, so you’re speaking directly to your customer’s needs and pain points. Because here’s the harsh truth: no one cares about your products or services unless you give them a reason to. A good buyer persona helps you uncover what your customer truly values. When it comes to putting together a marketing strategy, most marketers will agree that identifying a target customer is important. But why invest so much time and effort in developing buyer personas? First, creating buyer personas implies a shift in how you think about your customers. If you’re simply trying to identify a target market, you’re probably identifying who you think is best-suited to your products or services. Building a buyer persona means you’re putting yourself if your customer’s shoes, so you’re responding to what they want and need. Furthermore, when most businesses talk about their ideal customer, they are focusing on a collection of demographics. While demographics may narrow down your audience, they aren’t as much help when it comes to creating strong, differentiated messaging. For example, a beauty salon might say they’re targeting female professionals, ages 25-35, who are married but have no children, and have a household income of greater than $80K. Does this tell you something about their ideal customer? Absolutely. But does it tell you whether they’re interested in the newest styles and fashion trends, or if they’re looking for efficient in-and-out haircut? Not so much. 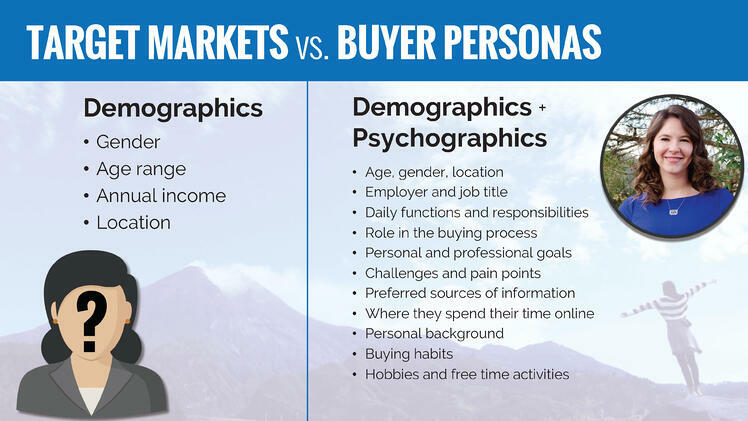 Buyer personas are more than just a target market. They go beyond demographics to identify your ideal customers’ desires, challenges, and values, so you market differently to different types of people. Your customers expect that sort of personalization. Whether your business is B2B or B2C, all marketing is person to person. The more you can understand and empathize with your customers, the better you can authentically reach them like a real human being. Sometimes marketers become so over-zealous in seeking to understand their customers that feel they need to know every single detail about their lives. Unfortunately, that means they often waste time collecting irrelevant data. We’ve seen interview questions that are so detailed they just get creepy (things like “what kind of parenting style did you grow up with?” or “were you a loner in school?”). Remember that personas are generalizations. Unless you’re personalizing messages for every single person, you want to look for commonalities between individual customers that you can apply to a larger group. You don’t need to know intimate details about their personal life, or what their favorite breakfast cereal is. And unless you’re in a retail B2C business, traditional demographics like someone’s gender or marital status likely aren’t that important either. Does this substantially change how my customer makes decisions? Am I going to differentiate my marketing message based on this information? While every business is different, and you may want to adapt this to your specific needs, here is the basic template we use for our buyer personas. Keep in the mind that the questions you ask in each of these areas should be skewed toward the product or service you’re selling. If you’re in a B2B business, you’ll probably focus more on your customer’s professional life and how they evaluate business solutions. If you’re selling B2C, you’ll want to ask more about their personal goals and pain points. What are they responsible for? What kinds of decisions do they need to make? Who else do they interact with in making decisions? What do they dedicate their time, effort and/or money to? What tools, skills, or resources do they need to achieve their goals? What do the value most in a product/service like yours? What prevents them from achieving their goals? What frustrates them most about the product/service area you’re addressing? What do they try to do to alleviate those frustrations? What information do they need in order to make a decision? What are the most important factors they look for in evaluating a solution? What would prevent them from buying your product/service? How do they get information? Do they prefer certain channels or formats? When do they consume content? During the work day, or at home? How much communication do they want to receive, and how often? What sources do they trust? To download a copy of this template, click on the link below. Even if you’re crunched for time, you still need to invest the effort in doing research. If you want your buyer personas to be useful in guiding your marketing strategy, you can’t rely on guessing or making things up about your customers. What kinds of different prospects do you interact with? What are the top most frequently asked questions you get from customers? What are they looking for from a solution like ours? Why do customers choose our solution over others? What common objections do you get from prospects? What are the most common complains you hear from our customers? What do they like the most about working with us? Who are our best clients? Why? Who are our worst clients? Why? Check your analytics from any source you’re using for marketing: website, email, social media, or your CRM system, if you have one. What types of content are your customers looking at, or engaging with? Are they downloading certain pieces of content? What pages are your website visitors looking at, and what sources did they come from? Look for patterns that identify what information your customer finds interesting and relevant. While not as efficient as knocking out your questions in an interview, you can get direct customer feedback in other ways. Develop a survey, and send it out via email (but note that you might need an incentive to get responses). Or, add an extra field to your online forms to ask customers about their biggest challenge, or their #1 priority when it comes to your product/service. There are tons of places online where your customers might share information you can use to develop your buyer personas. Check questions sites like Quora or Yahoo answers for problems your inquisitive customers might be asking about. It might sound stalker-ish, but Facebook and LinkedIn are great places to learn about your customers – people share an enormous amount of information about themselves on social media. Look for industry blogs, and competitor’s content to learn about what others in your space are talking about. Depending on your business, you might even find that sites like Reddit have interesting discussions you can follow. Buyer personas don’t need to be a source of fear or anxiety. Using our template or your own version, just start filling in information as you go. You’ll discover quickly that you’re identifying more about your customers than you ever knew. If you need help in identifying your buyer personas for your business, we can help! We offer a variety of digital marketing services and we can assist you in developing your buyer personas to help build and grow your business.